Any property that is used for income producing purposes has a potential for tax depreciation. In order to maximise the tax benefits, investors require the services of a registered quantity surveyor to optimise the depreciation results and maximise tax benefits. Download our Tax Depreciation Wizard app now. Not on mobile? Download and complete the forms here. Any property that is used for income producing purposes has the potential for Tax depreciation credits. In order to maximise depreciation credits, the owner will require the services of a registered Quantity Surveyor and a Construction Economist to optimise any claim. TDW staff are highly qualified Quantity Surveyors and Construction Economists with the required experience in construction costing. Their skills and expertise are recognised by the Australian Tax Office (ATO). The Australian Tax Office (ATO) allows investors to choose between two methods of claiming depreciation on fixtures and fittings: Diminishing Value or Prime Cost. The choice between these two methods is based on the investment strategy. The two methods use different formulas to calculate depreciation deductions, resulting in different short and long-term cash flow positions for the property investor. TDW reports present a projection for both Diminishing Value and Prime Cost methods between one (1) and ten (10) years allowing investors to make informed decisions. TDW has developed a Tax Depreciation App which can be used either online or downloaded onto a mobile device. 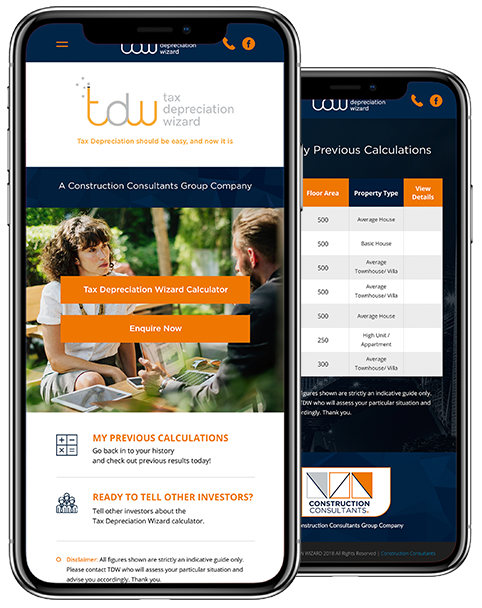 The TDW App is designed for Property Investors, Accountants, Developers and other Professionals and provides indicative deduction figures which may be used as guides for existing and prospective investments properties. TDW incorporates a rational and organised approach to ensure that the maximum numbers of depreciable items are identified, optimising deductions in the first ten (10) years of property ownership. TDW frequently liaise with the ATO, consistently identifying new rulings and generating maximum benefits to Investors. provide more accurate depreciation schedules. Website Designed by Rezwan 2019 © All rights reserved.